There are many types of weeds found in our area. Some of them are easy to control or can be eradicated by just pulling them. Others are very tough to kill and need to be sprayed with weed killers. The first rule is to always read and follow the instructions on the label of products. If you have a hard to kill weed, adding more weed killer than recommended won’t help. Sometimes it makes the product less effective. When you spray weeds, the chemical must be absorbed through the leaves. If the leaves are dirty, it’s harder for weed killers to work. So, it’s always a good idea to wash them off with a hose and let them dry before you apply weed killer. Also, I always recommend using a surfactant Spreader Sticker. This is an additive you mix in with a weed killer. It essentially acts like glue. It breaks surface tension, allowing the product to cover more leaf surface and also helps it stick better. Its ideal for fuzzy or small leaves. If you use Spreader Sticker, you’ll get better results. Finally, make sure to apply when the wind isn’t blowing. What type of weed killer should you use? First, there are products that are non-selective, that means they will kill anything, including your lawn, flowers, vegetables, trees, and shrubs, if the product comes in contact with the leaves. These products are great to use in alleyways, driveways, and selective use in the landscape. It’s also a great product for hard to control weeds and grasses in your vegetable garden before you plant. Many of the most common non-selective weed killers contain the active ingredient Glysophate. They’re commonly known as Round Up or Killzall, to name a couple. There are a few reasons we prefer Killzall. First of all, it’s less expensive. A bottle of Killzall is more concentrated than Roundup. 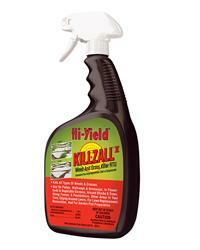 When you calculate the number of gallons each products makes, you’ll find that Killzall is nearly half the cost. One difference between the two products is the Roundup will make the weeds wilt sooner, but it takes just as long to get a total kill. These products need to be applied when weeds are actively growing and the temperatures are warm. Second, there are products called broadleaf weed killers. Essentially, they kill dandelions and anything that has a leaf that isn’t like a blade of grass. Use them in the lawn for dandelions and other common weeds. You can even find lawn fertilizers combined with these weed killers. 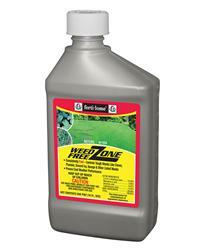 There is a great weed killer called Weed Free Zone that totally kills dandelions and other weeds in your lawn. The third type will kill grass but not anything with broad leaves. Grass killers are great for grass growing near vegetable gardens, landscapes, and even in the raspberry patch. The product that works the best is “Over The Top“. You can even use this to kill grass around irises and select perennial flowers. Some common weeds that need to be controlled in the spring are thistles, puncture vine (goat heads), and purslane. Weed Free Zone is extremely effective against these weeds. Dandelions can be controlled with Weed Out granules with lawn fertilizer in Mid-May. Or, if you have a lot of them, you may want to spray with the Weed Free Zone. Many people have quack grass growing in their yards. Quack grass spreads by its roots, or rhizomes. This means that when you try to pull it, the roots break apart and new shoots will grow. If you keep pulling, it won’t go away. If its growing in your lawn or vegetable garden, a spring spot treatment of Killzall or Grass killer will help control it. It will take many applications to completely control it. Fertilizing your grass will also help choke it out. People commonly confuse quack grass with crabgrass. Crabgrass is a totally different weed that spreads by seed, not roots. Therefore, it takes a completely different product to kill it. Crabgrass killers are heavily advertised because it’s a big problem in many parts of the country. However, it’s only occasionally found in lawns in our area. Crabgrass controls or preventers may not stop quackgrass. There is a weed called annual bluegrass that plagues many lawns in our area. It shows up in the heat of summer as large patches of lighter green grass. Small seed heads also form and it regrows from seed. Spring is the time to control it. 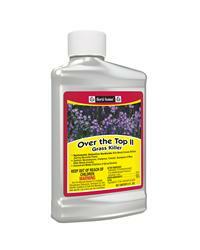 Apply All Seasons pre-emergent weed preventer to stop them from growing later in the summer. Weed barriers are very effective at controlling weeds. For your landscaped areas, like under trees and shrubs, you can use a weed barrier fabric. There are many types of weed fabric available, but it’s worth it to purchase a good quality one. Plastic sheeting should never be used. Look for a fabric that is rated to last more than 20 years. Also, make sure to get one that is woven, so the water and air can get through, but it can’t be torn. Remove weeds and level the ground before installing a fabric. Small weeds may grow above the fabric, but they’ll be easy to pull. In the vegetable garden, biodegradable paper weed block can be used. This discourages weed growth and helps prevent many weeds. Once your flowers are planted or your seeds are up and growing, you can also use a product like Preen or Treflan granules to prevent weed seeds from sprouting. How can I control weeds organically? One of the best methods for weed control is mulching. First, remove existing weeds. Then, apply a 2-3″ layer of our weed free compost, or soil pep bark mulch. Adding this layer will prevent most weeds from growing. This can be done in flowerbeds and veggie gardens. In the landscaping, using our 20 year weed block fabric is most effective weed control and its done without chemical sprays. In the vegetable garden, using cover crops is one of the best methods for weed control. Cover crops are seeds you plant that help starve weeds of light and nutrients. They also can be tilled into the garden, providing extra nutrients to plants. When using granulated fertilizers, don’t broadcast them over the entire garden. Instead, apply them near the plants so the nutrients aren’t available to weeds. Timing is very important too. Cultivate weeds when they are young with tools like a Winged Weeder. This uproots weeds so they won’t grow. You can also use a method called “solarization” if you have a lot of existing weeds. This is done by applying clear plastic over a moist garden. It allows the power of the sun to make the weeds grow, and the humidity will kill them. 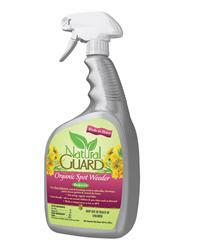 Finally, if you have annual weeds, we have Natural Guard Weed Killer that will kill anything you spray it on. It isn’t as effective on thistles, or hard to control weeds. We can help you with all your weed control questions, so visit us today for more information.